Valentine’s day has got me thinking about the nature of love. I’ve always scoffed at the suggestion of love as a natural force like gravity (it was an eye-rolling moment for me in “Interstellar”). But then again, isn’t love the result of chemicals produced and exchanged between our brains’ neurons? Aren’t there hormones involved, and sweat and saliva (among other things)? These are very much real things that require the consumption (and creation) of energy, albeit in small quantities. So, who am I to say that love isn’t a natural force? It certainly is a force of nature. Or maybe love is a parasite, that infects humans in order to ensure its continued existence. There is a fungus called ophiocordyceps unilateralis that propagates itself by infecting carpenter ants with its spores. The spores burrow their way into the ants’ brains and take over their behavior (which is why the fungus is also known as the “zombie fungus”). They force the ant to climb up a leaf and bite at the underside of the leaf, unable to unlock their jaw and therefore unable to move or walk away. The ants eventually die, still gripping the leaf. Soon, from the back of the ant’s head grows a long stalk that begins to release spores that land on the ants walking around below, thus ensuring the next cycle of zombie ants. Creepy, you say? Nothing to do with beautiful love as we know it? To you I say: have you ever seen the irrational, crazy things love makes people do? I wouldn’t throw out the parasite theory just yet. But for you romantics out there (and I count myself amongst you), here is a third possibility. Maybe love is just a lovely mystery, something greater than the sum of its parts.I like this idea of love as a peculiar process that enriches and transforms us. A little like the way in which when air is introduced into slimy, pale egg whites, it turns them into dazzlingly white, ethereal clouds, ready to be baked into crispy meringues, transformed into angel food cake, or folded into melted chocolate to make a silky smooth chocolate mousse. 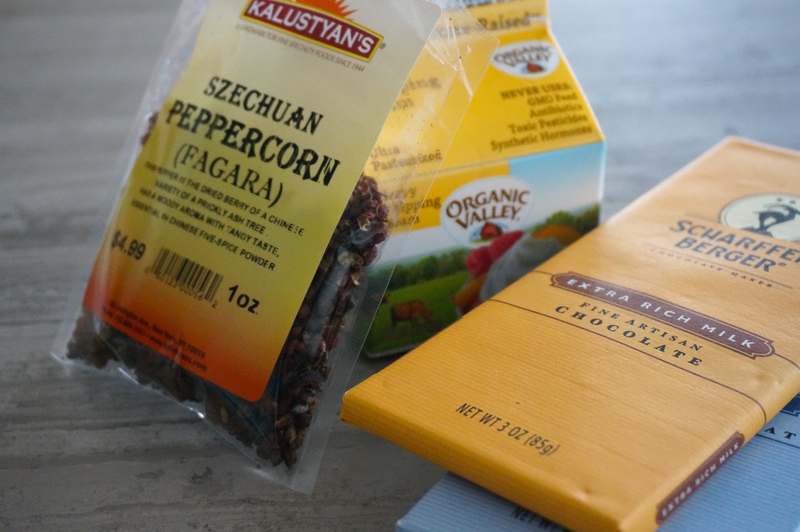 Note: If you can’t find sichuan (or szechuan) peppercorns you can simply omit them. But they do add a nice, subtle zing to the mousse. Coarsley grind peppercorns in mortar and pestle or using a bowl and back of a spoon. Bring cream, coffee, and peppercorns to a simmer in a small saucepan. Remove from heat and let steep, covered, 30 minutes. Strain cream through a fine-mesh sieve into a bowl, pressing on solids. Melt chocolate in a large bowl. Stir in cream and mix with spoon until completely combined. Cool slightly. 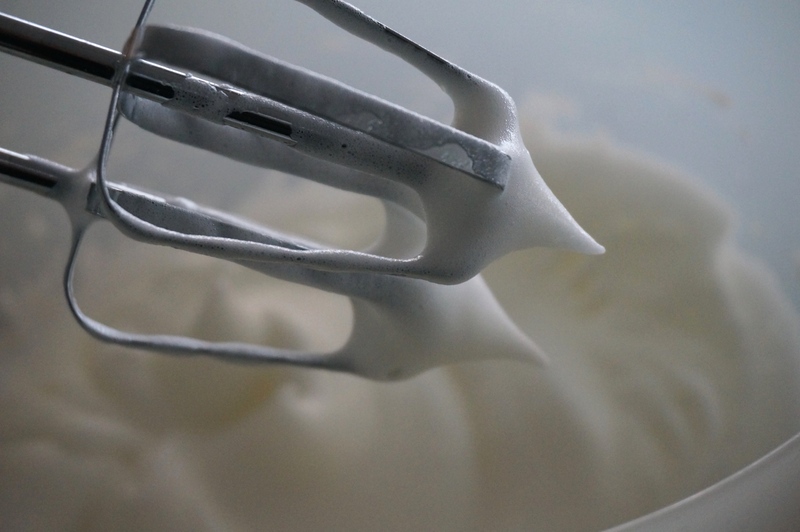 Beat egg whites with sugar using an electric mixer until they just hold stiff peaks. 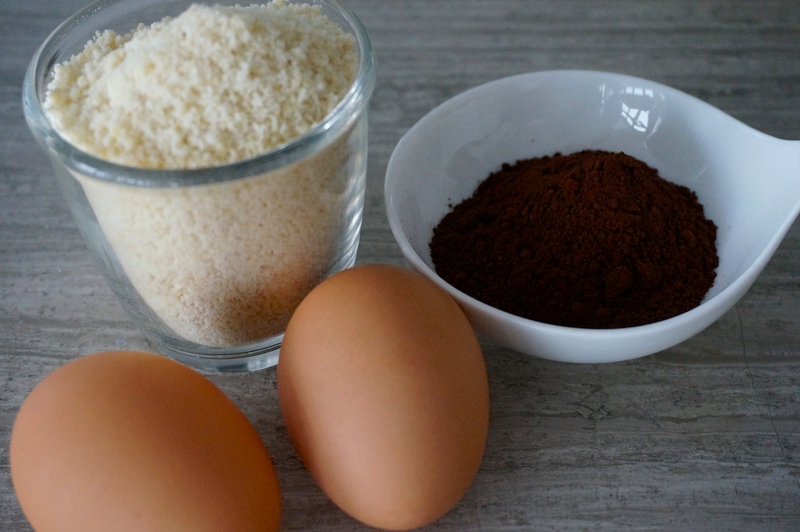 Fold egg whites into chocolate mixture gently but thoroughly (no white streaks remaining). 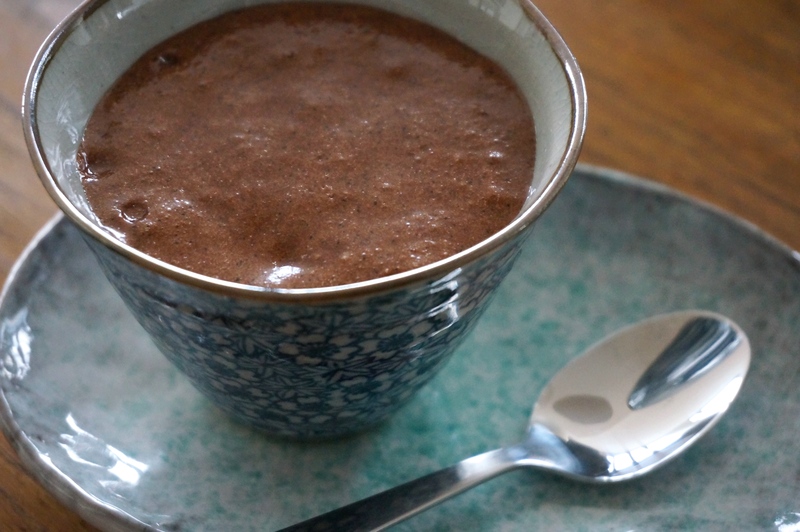 Spoon mousse into 4oz-5oz serving glasses (it will be runny; it will firm up once chilled). Cover and chill at least 3 hours before serving. Mousse can be prepared ahead and kept in the fridge covered for up to 2 days. This is what my cookbooks look like. Whenever I buy a new one I go through it and mark any recipe that looks like something I’d want to try. I like to use these nifty Post-it bookmarks that are clear where they attach to the page so that they don’t cover anything. 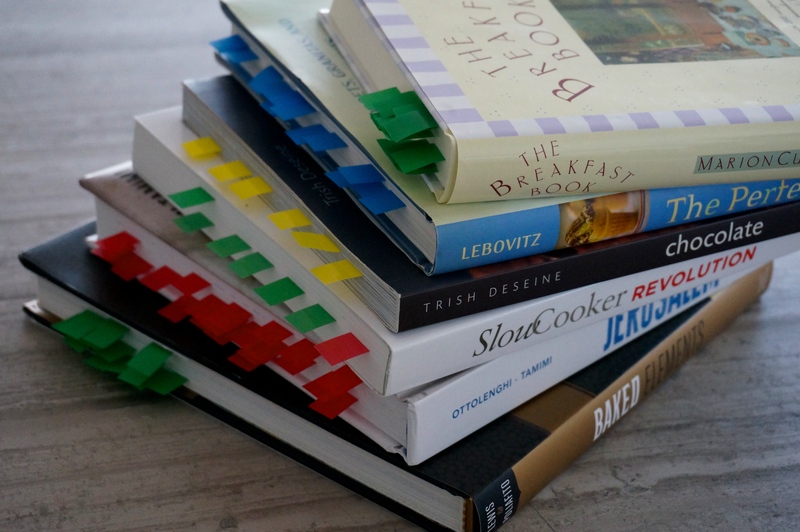 As you can see from the photo (and this is only a small sample of the cookbooks I have), I end up with a lot of recipes that I want to try out. And this doesn’t include recipes from magazines and blogs, which I collect using the fantastic Paprika recipe manager app. To make a long story short, I really shouldn’t be adding to my collection of recipes to try. But the other day I was reading a newspaper from back home online, when at the bottom of the page I noticed the title of a recipe: Incredibly Light Chocolate Orange Cake (without Flour). I was intrigued. Chocolate and orange are one of my favorite flavor combinations (here’s looking at you, irresistible orangettes!). A quick look at the ingredient list revealed ground almonds as the substitute for flour and boiled, whole oranges as the substitute for butter. I was beyond intrigued. I had to try it. The result was actually very interesting. 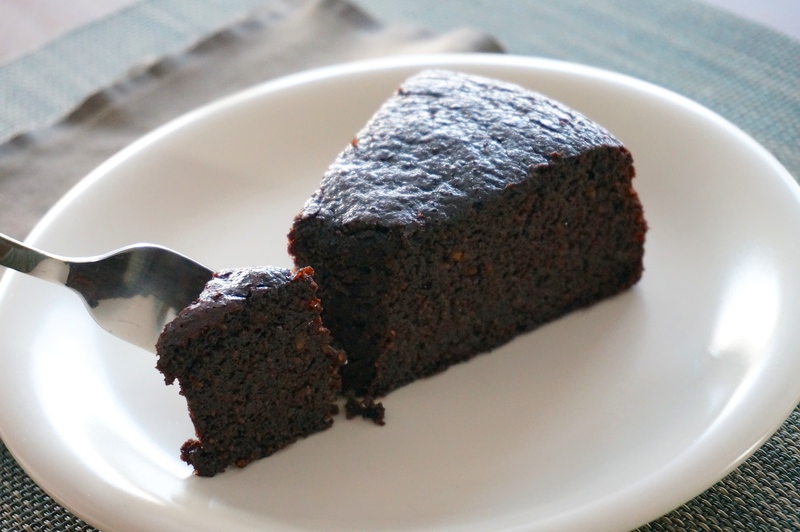 A moist cake with a distinct chocolate taste but redolent with aromas of orange. I say aromas because the presence of orange in this cake goes beyond what you would get if you used only orange juice. 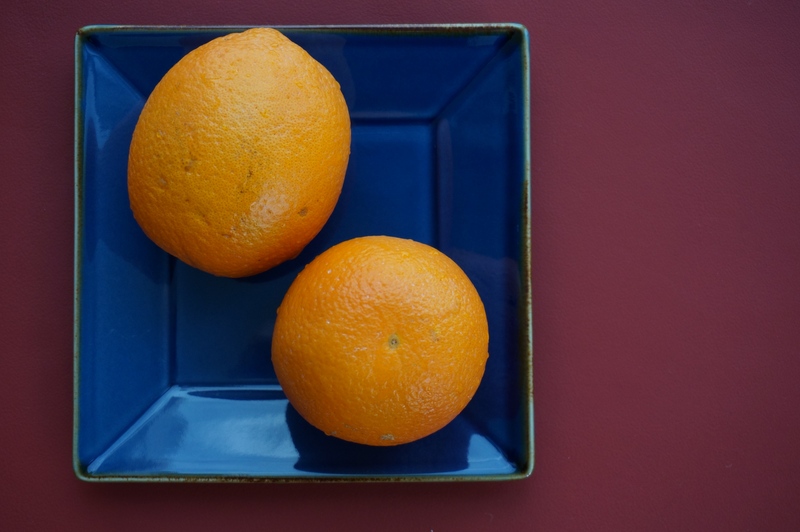 Since it incorporates the entire fruit, you get the sweet and tangy flavor of the orange segments, the mellow bitterness of the pith, and the sharp taste of the orange oil from the rind. All together, it creates a not-too-sweet cake that begs for another bite, if only to decipher the complex combination of tastes hitting your tongue at the same time. I know this post seems to come a day late, given that yesterday was Valentine’s day. But Steve and I don’t really do much on Valentine’s day, a day we feel ambivalent about. Back in my single days, I used to hold a dinner party for all my single friends, making beef bourguignon and a chocolate torte, all of us toasting to our singledom, in defiance of this silly holiday that taunted us. Now that I think about it, given the bitter and sweet flavor combinations of this cake, it would perhaps make a perfect Valentine’s day cake, for both those in celebration of the day and those who don’t like it. Preheat the oven at 350º F (180º C). Lightly grease the bottom and sides of a springform 8″ (20 cm) cake pan. Cover the bottom of the pan with parchment paper. Roughly chop the oranges, remove any pits, and place in the bowl of a food processor. Add liqueur and process until no pieces of orange are left. The mixture should be a relatively smooth pulp with small pieces of rind (it doesn’t have to become completely smooth). Add the baking powder, baking soda, cocoa, sugar, almonds, and a pinch of salt. Process until combined. Add eggs one at a time, processing until each egg is combined. Pour mixture in prepared pan and bake for about 60 minutes, until a cake tester inserted in the middle comes out clean. Immediately run a sharp knife around the edge of the pan and place the pan on a cooling rack. Let cake cool completely in the pan.